I've been sick. And too hot to use the computer. Life has been going slowly. 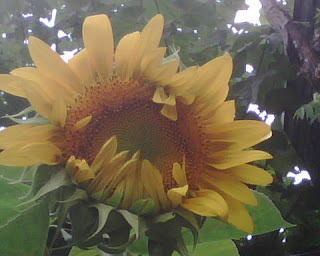 I have my first sunflower bloom. Finally. The plants are much taller than I am, I had to stand on a chair to take this picture. My tomato plants are producing almost more tomatoes than I can eat or use, but I'm doing my best. Who knew four tomato plants would produce so much in a cement box in a south Philly yard? I didn't think anything would grow, the light's not the best. Nature sure proved me wrong! Last week I made a great discovery in Chinatown. I went with my roommates to get bubble tea and run a bunch of errands, and we went to this bubble tea/bakery place (like most other places that sell bubble tea). My roommate got this weird looking thing called a snowball. It looked kind of marshmallow-y and was full of peanuts, the outside was covered with coconut. I asked the guy working there what it was made of and he told me it was rice flour, no wheat, safe for me to eat. 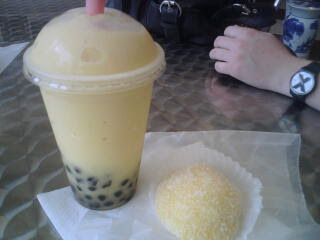 I got a yellow one, which was full of fresh mango. It was amazing. Gooey but solid on the outside, perfect fresh sweet mango inside. Most Asian bakeries (I found from searching all over Chinatown a few days later) usually only carry coconut filled and peanut filled ones. Both are good, but not as good as the mango. YUM. Yesterday I was craving carrot cake, and while these didn't turn out exactly as I had wanted, they were really good. Not sweet enough without the cream cheese icing, but still good. I made these from a recipe adapted from the Joy of Cooking into gluten-free. spices - cinnamon, clove, nutmeg, allspice, cardamom, ginger, your choice. I used cardamom, ginger and cinnamon, not having the patience to find the other ones. Mix together dry ingredients, mix together oil and eggs and beat lightly, then combine. 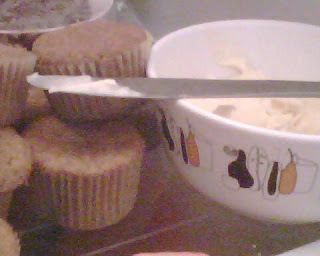 Add carrots, pour into cupcake tins, bake at 350 for about 25 minutes until a knife inserted comes out clean. These are really light. Frost them with your favorite cream cheese icing, I didn't write down how I made mine I just threw everything together in the food processor. Sorry! **Due to monetary restraints, I have been making my brown rice flour mix with half (or more) white rice flour instead of all brown rice flour. I lose some of the nutritional value I'm sure, but it tastes and comes out fine. oh wow! 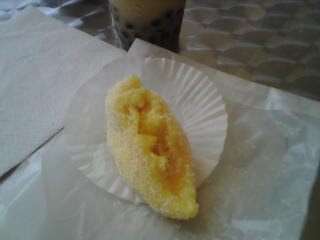 I want one of those marshmallow mango thingies ... I wouldnt mind sampling the cupcakes either. I just love carrot cake, but havent had any for a few years now! 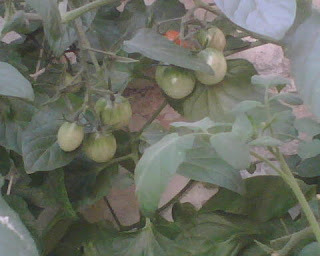 My tomato plants are in 1/2 gallon pots on my balcony and most of them are about twice MY size too. Who would have thought they'd grow into being such giants??? carrot cake is so easy to make dianne! try it! sea, it's been a few years since i've grown anything at all, I'm surprised at how well my little garden turned out! It's so great to have fresh tomatoes every day! do you mean tsp or tbsp?